Woo hooo! 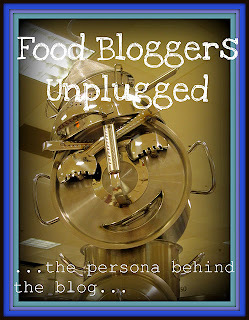 I was recently tagged for Food Bloggers Unplugged by the Hungry Hinny and Jo from What do you make of my cake? - thanks ladies, I was seeing more and more entries popping up and hoping to be able to join in! 1. What, or who inspired you to start a blog? When I started baking I was taking pictures of the stuff I'd made anyway, and had started a Baking album on Facebook already to keep a record. I'd dabbled with blogging a bit in the past and after I finished uni I was out of work for a while and had the idea to start up a blog about it just to pass some time really and keep a more detailed record, then it just kind of grew from there! OK so I know these are completely unseasonal, but I wanted to make something for Mike's sister Louise's birthday that was a little bit different to your standard cake or cupcake. I had seen ice cream cupcakes on a few blogs in the past and thought it was a really good effect so decided to try them out. For some reason I had it in my head that I would have to bake them normally then just place the cupcakes in the cornets... but after a quick google I found a recipe that was actually in a book that was sitting on my bookshelf - the WI Celebration Cupcake book. 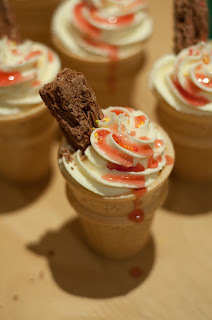 Turns out you can just bake them in the cones! Ever since my courses in cake and cupcake decorating I have been slowly building up an arsenal of cake decorating weaponry (this could be an expensive hobby!) and a few weeks ago I was finally ready to try out some of my newly acquired skills. I had to keep it simple as I had the bare minimum of equipment! So I coloured some white sugarpaste pink and then stamped out some flowers. After a few head-scratching moments I remembered how to make roses and made some of them too. 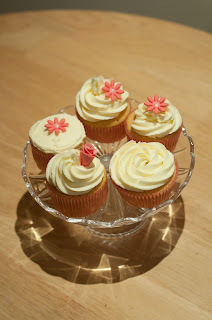 I was the most excited about using my new piping nozzle, the Wilton 1M that we had used on the cupcake course, and was even more excited that I actually remembered how to pipe properly - especially the rose swirl as I love the effect.